Margins are getting tighter and labor is getting harder to find. Learn how landscapers are increasingly turning to their equipment to solve these problems, and how expanding access to power sources, robotic machines, and other innovations are changing the way their businesses operate. Chuck Bowen of the Outdoor Equipment Institute will lead this session. With a growing population, there are two issues currently facing the green industry: how to feed a world with less space, and how to generate a workforce that can continue the work. In an effort to determine technology's impact on sustainability, Westminster High School students have implemented a FarmBot to explore the pros and cons of a growing technology industry as it directly relates to agriculture. Join them as they discuss their trials, plans, and how getting youth and technology involved may be just the answer to an ever-growing problem. Presented by Westminster High School Agriculture and Technology Students. Westminster High is a participant in ALCC’s Landscape Career Pathways Program. Candidates for Landscape Industry Certification should attend. This focused class will review the most common calculations and formulas used in irrigation design, installation, auditing, and maintenance. After a well-attended session in 2018, Paul Wait returns to present a more detailed course for irrigation technicians. He'll cover backflow basics, details the operation of RP and PVB backflow preventers, approved installation standards focused on line flushing/drainage/winterization, detailed troubleshooting of system related issues, annual maintenance and testing. Vice president of research and development at The Davey Tree Expert Company Dr. Daniel Herms will present this session about how the tree care industry is adapting its services to our changing world. Learn how the industry will be impacted, and how urban forests may be able to mitigate the effects of climate change. 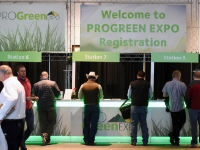 See the full schedule, including dates, times, and locations for the sessions above, at www.progreenexpo.com/Schedule/Education-Schedule. What is a well-being program?